Please Note: This birth story MAY be distressing for some. What happened to me was a 1 in 200 chance. I do not want to scare any expecting mamas; remember every single birth is different and just because this is my experience that doesn’t mean yours will be the same. Willows birth was unfortunately the most traumatic experience of my life, however unlike many placenta abruption stories and births ours has a happy ending. It was Wednesday the 6th December 2017, I was currently 37+1 weeks pregnant. I had a stressful week prior. A lot going on with family, getting ready for Christmas, trying to get ready for the baby and also nesting like a crazy woman! I was in a complete organising, cleaning frenzy, with my victim being the pantry (because of course this is the most important thing to get ready for the newborn). 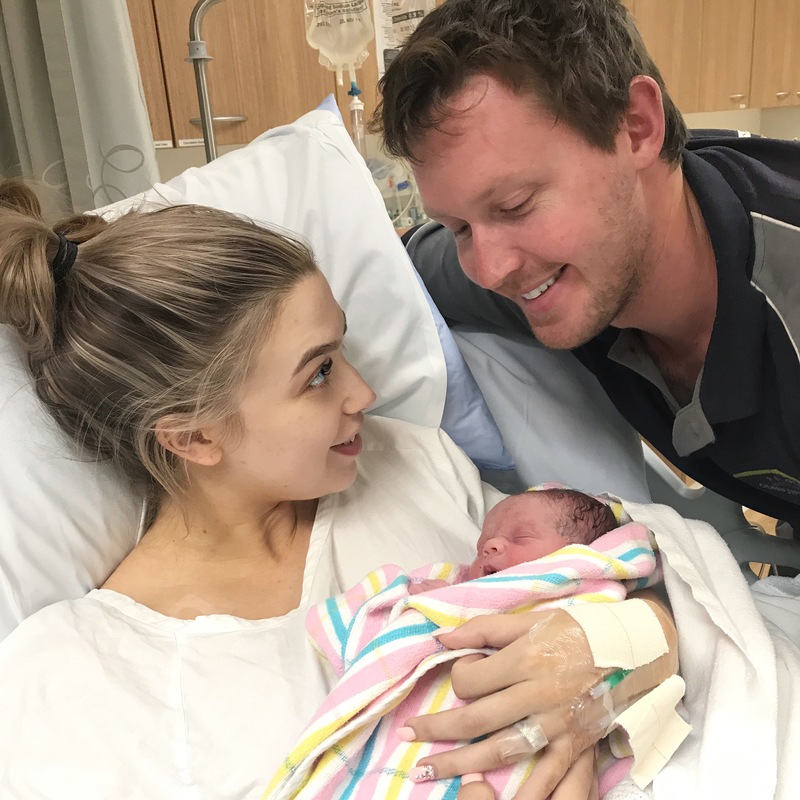 A few days before I went into labour I had been experiencing what I thought were Braxton Hicks contractions (with Harper I was induced which is very intense from the start so I assumed these contractions couldn’t be pre-labour as it wasn’t too painful). The Braxton Hicks continued over a few days and then Wednesday morning I woke up feeling odd. I can’t really explain exactly how I felt, but I was ridiculously emotional. Most of the day I was crying my eyes out about how Harper will have to share my attention and time (your usual mum guilt). It’s like subconsciously I knew that something was going to happen that day; a weird inkling that baby may decide to come. 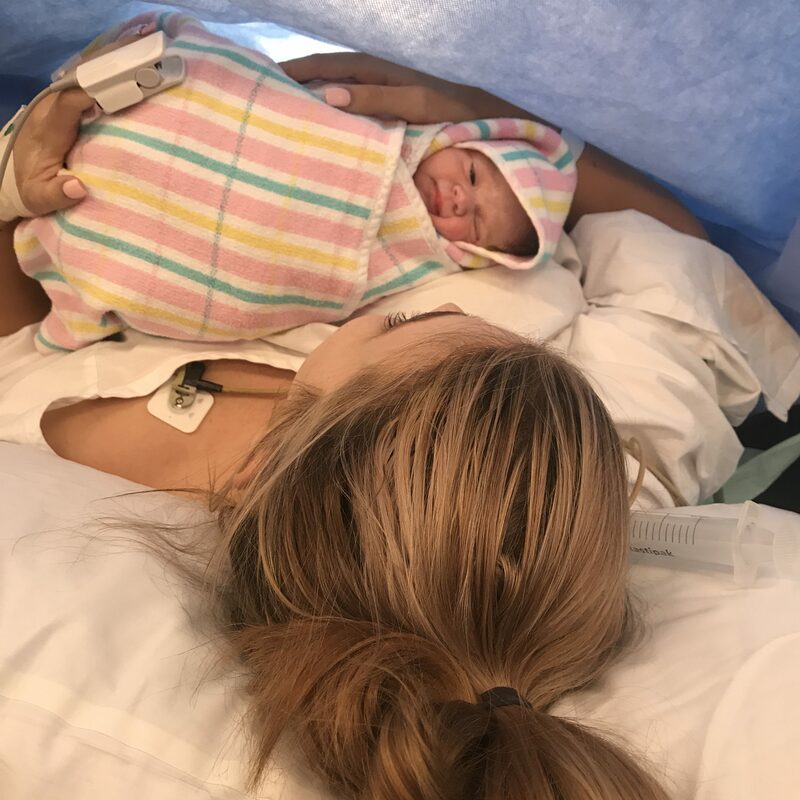 My induction date was already set so I kept telling myself I wasn’t lucky enough to go into labour naturally and just continued on with my day. Whilst getting these contractions I completed my usual cleaning, emails, groceries and picked Harper up from daycare. On the way home with Harper I rang Ryan and asked if we could go to Kmart to get more containers to organise the pantry. I picked up Ryan, who was already home from work, and then headed up to the shops. We decided to eat at the Coffee Club for dinner (which I’m so glad I did now because little did I know I wouldn’t be eating again for a couple of days). A big bowl of pasta later and by this point the contractions were becoming longer and more intense so I began to time them (still not believing I was in labour). Ryan kept telling me we should go home so I could rest however I insisted I needed to get these Kmart containers. Before heading into Kmart, Ryan had to use the toilet. I sat on the seat waiting for him holding my belly and continued to time my contractions which were around 3 minutes apart and lasted 40 seconds. I must have looked uncomfortable because a woman asked me if I was in labour and whether I needed any help. I laughed casually breathing through the contractions and said “no I don’t think so but thanks so much!”. After we finished at Kmart we started walking out and suddenly I felt a gush! I got so excited; “Ryan my waters broke!”. Ryan looked excited and shocked too. Then I saw something that instantly changed the mood…blood. My hands and pants were covered in blood, my heart stopped and instantly I felt a deeply sickening feeling. In that instant I thought she was gone. I screamed and Ryan went white as a ghost – we knew this was not good. We rushed to the car and shoved Harper in the car seat (the poor thing was crying because she didn’t understand what was happening). Ryan grabbed my gym towel from the back to put between my legs as I had blood dripping down my legs. I couldn’t control my breathing and everything went so incredibly slow. Every second that passed I felt Willow slipping away from me. It was the most dreaded, terrible, gut wrenching feeling I’ve ever experienced. I rang my Obstetrician’s office right away as Ryan drove to the hospital. My doctor’s receptionist told me to head straight to the labour suite. I tried to get reassurance from her that somehow this could be normal and she replied “it’s not normal but just get yourself to the hospital”. This is when I started having anxiety attacks. I yelled at Ryan to hurry up even though I knew logically we couldn’t drive any faster. I could feel the blood continue to come out in gushes. Then I wondered whether I would even make it myself. I rang my doula, Amelia, and she tried to talk me through to calm my breathing down. I felt so dizzy and kept pinching my leg hoping this was just a nightmare. I rang my mum to meet us at the hospital so she could grab Harper. When we arrived at the hospital she was already there ready to take her. I still remember the look on my poor mum’s face when she saw me holding this bloody towel between my legs looking white as a ghost. I have never seen her more scared in my life. I then had to give Harper a very rushed goodbye which was heartbreaking. I always thought the last time I would see her before I had her sister it would be a special goodbye. Harper was crying her eyes out and didn’t want to let go of me. I knew the next time I would see her our lives would be changed forever – and at that point I didn’t know if it would be for better or for worse. Someone was standing at the door with a wheelchair and proceeded to wheel me into the labour suite with Ryan. To be honest some of this is just a blur now, I’m not sure if it’s because I was in such a state of stress. I was given a gown and disposable undies and pad to change into as I was covered in blood. I went to the toilet then felt something that I was hoping was my mucous plug come out. The midwife confirmed it was blood clots, my heart sunk, this is not good I thought to myself. They hooked me up to the monitor and as soon as I heard Willow’s heartbeat I felt a huge wave of relief but I knew it wasn’t over yet. 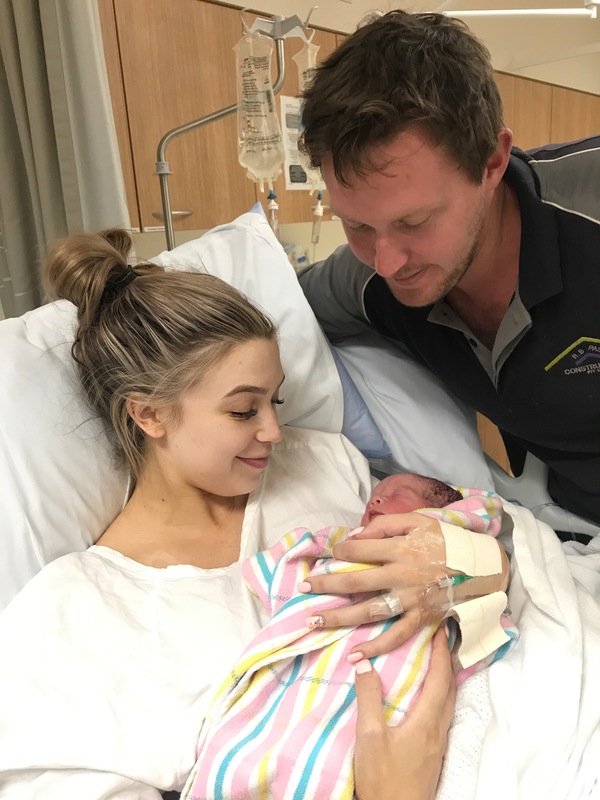 I think I asked the midwives a million questions about what could be happening and as soon as they said it could be a placenta abruption I looked at Ryan and cried. I’ve heard so many stories about placenta abruption and they never end well. I just wanted an answer. I tried my best to keep myself positive as another scenario they said was that I could just have a very large bloody show, but we all knew that wasn’t it. The nurse did an internal and I was only 2cm dilated. My doctor arrived and repeated basically what the nurse had previously said, but reassured me that the baby was happy and that because it’s my second baby and because her heart rate was stable he was happy for me to continue to labour naturally and hopefully she would arrive that night. I continued to labour through the night managing with hot showers and breathing techniques. As the night went on I continued to lose more blood and the blood clots started to get even larger; one was the size of a steak. At 3am the nurse came in and as I stood up off the toilet, blood came splattering all over the floor with more clots. She looked concerned and said she would call my doctor. The doctor then told her to start the syntocinon drip to get things moving along faster. By this point I was absolutely exhausted and still in a total state of panic not knowing what was going on. The morning came and the midwife did another internal…2 cm. No progress (yep just my luck). My doctor arrived and did an ultrasound to see the position of the baby. Her head was in a very awkward and odd spot. He explained that the position her head was in was stopping me from dilating any further, and unless she moved I wouldn’t progress. He decided to give me a few more hours to labour to see if she would move and if I would progress. She had her head and neck tilted right back so with each contraction she was pushing on the side of my pelvis (this ended up saving her life in the end). An hour later and Willow’s heart rate began to drop. My doctor said we needed to do an emergency c-section. I was then administered an epidural to prepare for the surgery. 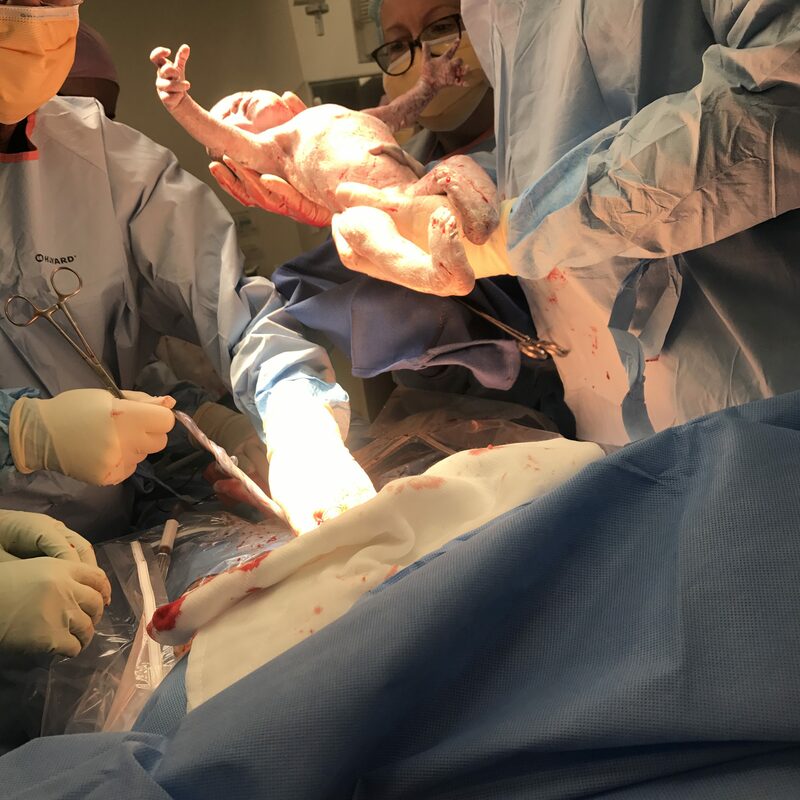 By this point I felt a sense of relief – they were finally going to get my baby out. 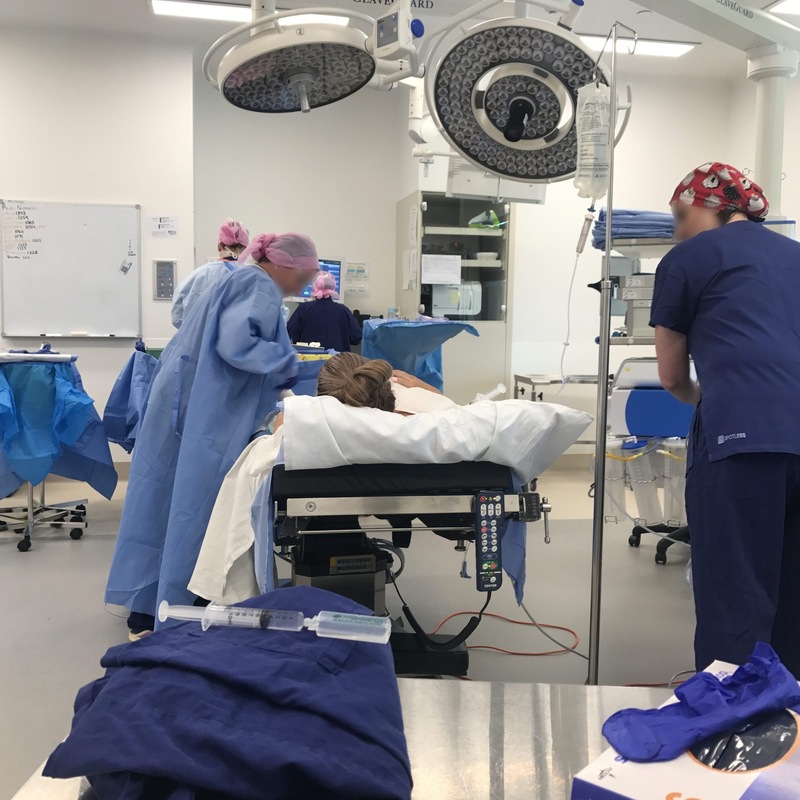 Within 15 minutes I was being wheeled down to theatre and I was a mix of emotions; relief that Willow was going to be out soon, terror that she may not make it, and of course I was scared of everything that was to come. Ryan was taken away to put some scrubs put on (the poor thing was still in his work clothes from the day before). Now I’m not a very religious person but I don’t think I have ever prayed so much in my life for my baby girl to come out ok. I knew she was going to be on the smaller side and that fact she was 3 weeks early worried me, not to mention the complications we were having. I vaguely remember the anaesthetist explaining some things to me but I honestly don’t recall too much. I think by this point my mind was on pause. I was wheeled into theater and there was a group of nurses and doctors in their scrubs with masks and gloves on – I must admit it was very daunting. They lifted me onto the operating table and put the sheet up just underneath my chest so we wouldn’t see anything. I just remember making Ryan put his face right by mine because all I really wanted was to hug him but I couldn’t so we were cheek to cheek. Ryan was whispering in my ear the whole time how incredibly strong I am and thanking me for making him two beautiful daughters. I just focused on what he was saying while they prepared my stomach ready for the c-section. I found my whole body shaking uncontrollably. They assured me it was because of the drugs I was given (I can’t remember specifics). Then my doctor said “ok” and then I felt the first cut “I CAN FEEL THAT!!”. This was when I began to panic that the epidural wasn’t going to work and that I would feel everything. They kept topping up my epidural to the point where I could only feel pressure and pulling. The next part was a complete out of body experience. I felt like a dead animal being hacked open and I could see the reflection of what was going on in the large overhead lights. Then my mind decided to take me to a beach, it was as if I couldn’t control it my mind just took me there. I’m not sure if it was from the hypno-birthing I learnt when I was pregnant with harper but it definitely helped. Those moments felt like a lifetime waiting to hear my baby cry. Nothing else in that moment mattered – our baby is here. Ryan looked at me and we both breathed with a huge sigh of relief. We both started crying and I thanked God a million times over. They quickly showed us Willow and then told Ryan to follow them over to weigh her and check her. I laid there waiting anxiously for Ryan to confirm she’s ok. “Is she healthy?” I yelled out and then the midwife walked over with this gorgeous baby girl wrapped up in blankets. I just stared at her beautiful pink face and just couldn’t believe she was here and she was safe. Then they took her back and the doctors proceeded to finish up with me. The vibe changed in the room and we heard a doctor say something about me not being stable and something about a transfusion. I felt a deep sickening feeling. Ryan and I looked at each other in horror and I thought this is it. I’m gone. I said to Ryan “look after our girls, I love you so much”. Ryan started sobbing and he hugged my head. This was the most dreadful moment of my entire life. A few minutes passed and the vibe in the room seemed to calm down. 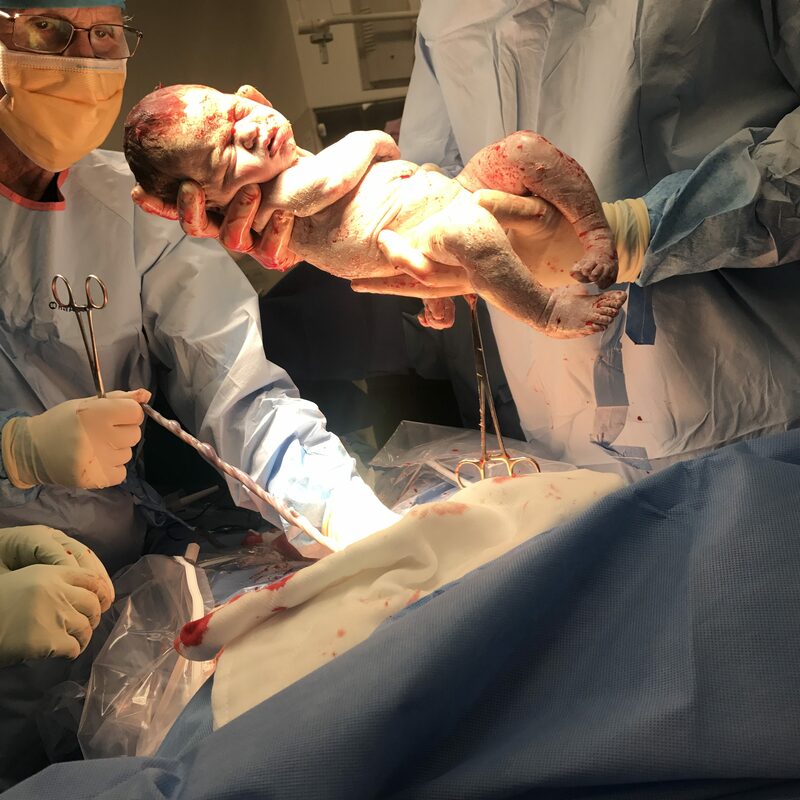 The doctor said to me “it was a severe placenta abruption, the cord was also around her neck four times, there was no way a natural birth would have ended well”. I knew now that I was going to be ok. I gave Ryan the biggest kiss of my life and we both just stared at each other so grateful. 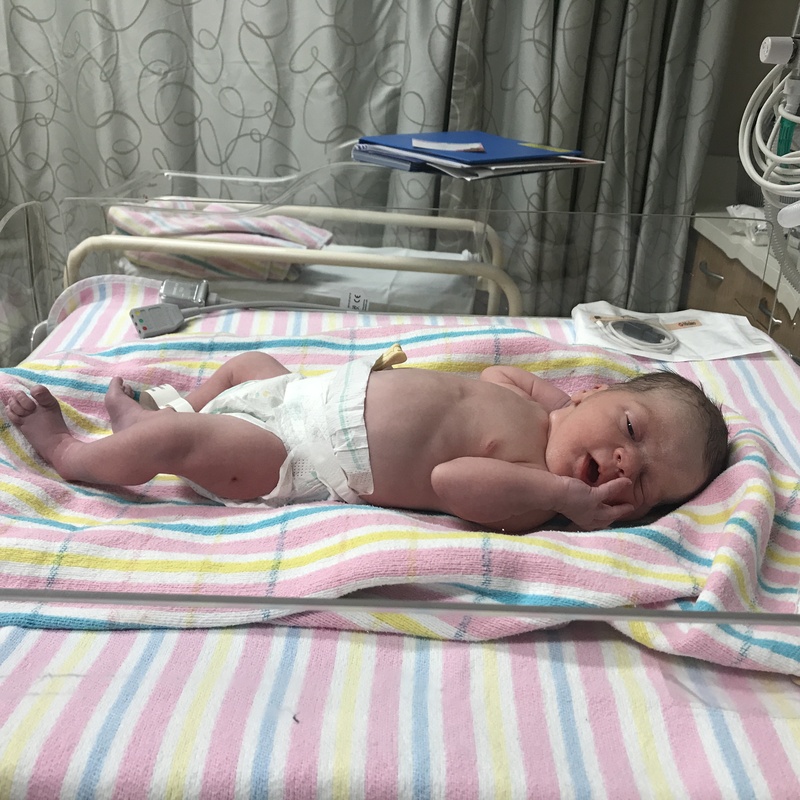 Willow was born on the 7th December at 11:30am weighing 2.4kgs and 47.5cm long. Due to her birth weight she had to go back to the nursery so I told Ryan to go with her while they finished up with me and then I would go to recovery. I remember laying in recovery just in shock that all of that had happened. I was just so insanely grateful that my baby girl had made it and I was going to be ok. It was a real eye-opener. After the nurses were happy with me they wheeled me into the nursery so I could be with Willow. I was shocked how different she was to Harper with her dark brown hair but such similar features too. Ryan looked at me and just kept saying how amazing I was and how proud he was of me. I was pale as a ghost and so puffy from all the fluids at this point. I still couldn’t move my legs so Ryan brought her over to me and told me how strong Willow was with getting her needles and that she didn’t even cry. Then I breastfed her for the first time and she latched amazingly. My strong little lady – I was already so proud of her. Willow’s birth is a story that panned out in a way that I didn’t expect. That’s the thing with birth, it is something completely out of your control. 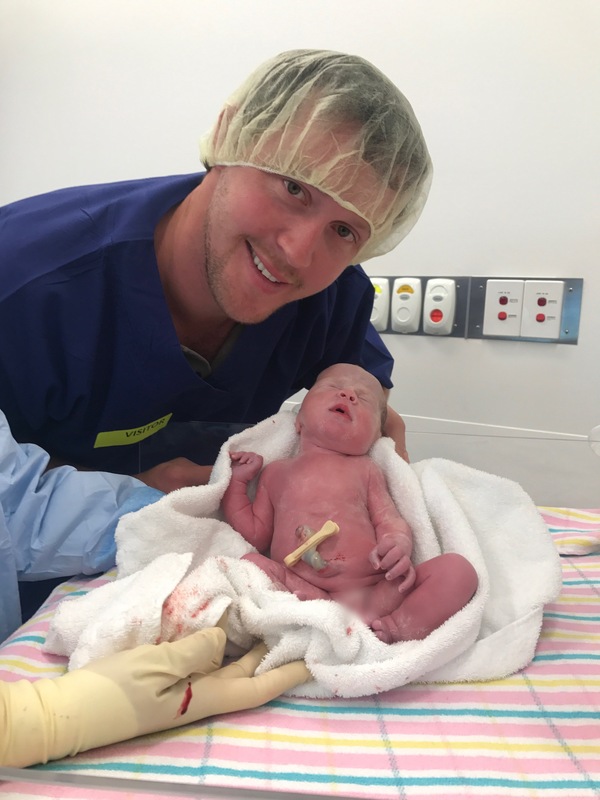 Sometimes birth stories aren’t about natural births followed by blissful skin to skin. Sometimes stories like mine happen and many women find it hard to accept and even suffer from PND from experiencing a traumatic birth. I have had my moments since her birth where I felt as though my body had failed us and even blamed myself for the placenta abruption. Then I remember how incredibly lucky I am to have even experienced labour and that I was blessed enough to have my healthy baby girl. At the end of the day that’s all you can ask for. Wow what an amazing story, with such a happy ending. I am so glad it was a happy ending for you and your sweet cherub, she is gorgeous! Your story brought tears to my eyes. Such a strong mama, thanks for sharing, and so glad you are both happy and healthy now. You are so amazing and strong, your story made me cry! no idea what made me think I should read this right now (21 weeks with my third babe, emotional/hormones central) and I weeped through half of it. I am so happy and relieved for you had a happy ending. Cried my eyes out! So happy for the outcome!! Thank you so much for sharing. I had an abruption January of last year at 37 weeks, that ended with a 2 week NICU stay. She is doing well now, but it is so helpful to read other experiences with it that ended in a good way as ours did because the emotions you described at the end I feel all the time. Thank you for sharing cause it really helps to not feel like you’re the only one this happened to!